In October 2018, the sculpture, Once A Tree II, was featured in a stage performance at the Yong Siew Toh Music Conservatory, NUS. The performance was a 25-minute opera by Claudio Monteverdi entitled Combattimento di Tancredi e Clorinda. The dancers and singers moved around the sculpture which is made up of many separate pieces. It worked beautifully for the performance as the pieces could be positioned and assembled on stage in whichever way the choreographer envisioned. fahcheong was NAFA Artist-in-residence in August 2018. During that time, he conducted a stone-carving class for the Nanyang Academy art students at the Bencoolen campus. For many students, it was their first time carving stone, and so the softer travertine was used. Using his work Terribile Quotidian as an example, fahcheong gave the students some food for thought. How do you come up with an idea for a sculpture? Students submitted their design ideas and these were critiqued. Then they learned to translate their designs into 3D reality through carving with hammer and chisel and grinding the stone. And finally there was an exhibition of all their efforts. In August 2018, fahcheong held a stone-carving masterclass for practising artists, organised by the Singapore Sculpture Society. Enthusiastic participants gleaned much from the workshop, as fahcheong shared with them tips and techniques and gave them a hands-on lesson on how to turning raw stone into sculpture. 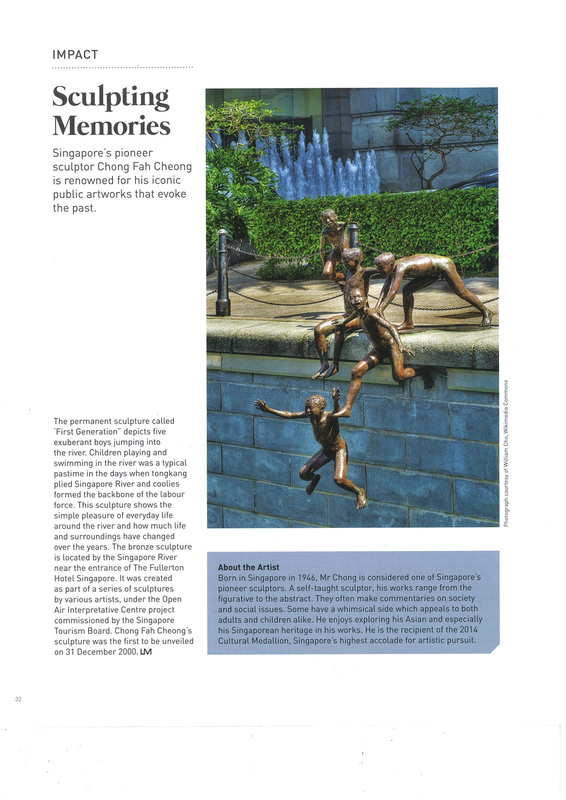 It was a long time in the making but finally Chong Fahcheong’s latest sculpture, Hey, Ah Chek! has found its home. You will find Ah Chek, Ah May and Ah Boy on the departure level of Changi Airport’s Terminal 4. When commissioned to create a local, Peranakan sculpture for Changi’s latest terminal, fahcheong typically dipped into his memories of old Singapore and came up with this vignette of grandmother (or mother, it matters not) and a young boy hailing a trishawman to take them home after a morning’s marketing. (No guesses as to who fahcheong was thinking when he sculpted Ah Boy!) The challenge of this sculpture was to create a trishaw that was true to the 1950s and 60s as the trishaws you see today, mostly tourist attractions, are more modern in design. So fahcheong scoured the streets of Singapore and searched Malacca and Penang (two other centres of Peranakan culture) for a trishaw of that era. He finally found a dilapidated one in Singapore, had it rebuilt, and used it as a basis for his sculpture. If you are travelling through T4, head to the right side of the departure level where the shops are. Climb aboard Ah Chek’s trishaw for a photo shoot, take a closer look at the intricate detailing of Ah Mah’s sarong and peek into the basket to see what she and Ah Boy are taking home to cook for lunch. Ah Chek at T4 departure level. He has a young passenger on board. This is an alert telling all who are looking at my website that my email address is currently compromised. I am trying to sort out this problem, but in the meantime, you can get in touch with me through my Facebook page, Chong Fah Cheong, Sculptor. You can also email me at my new email address, cfcsculpts@gmail.com. UPDATE on 30 Oct 2017! I have recovered my email address, and you may now resume contacting me at sculpt@fahcheong.com. However, beware scammers and hackers everywhere, and never open anything that looks suspicious. If in doubt, please contact me to confirm that my email is genuine and comes from me. Well, that’s what The Guardian calls this gallery of pictures, From Ai WeiWei’s Dog to Indian Wall Painting, and I am pleased to see that my kampong kids aka First Generation are in such great company. This is the link to the Guardian webpage.